Received: December 3, 2018; Accepted: December 20, 2018; Published online: December 30, 2018. The retrospective study included eight patients who underwent various types of surgery and the application of dual-frequency ultrasound for remnant wounds. The number of treatments until the wound was completely epithelized according to the photographic findings and chart review were analyzed, and a four point subjective scale of satisfaction was used to analyze the level of satisfaction. Patients were treated daily for six minutes each day. Photographs were taken at each treatment session, and satisfaction surveys were conducted after all treatments were completed. An average of 6.3 days was needed for 50% epithelization of the patients’ wounds and 14.3 days for complete epithelization. The average number of dual-frequency ultrasound treatments during the period was 10.7, and the patients were generally satisfied with the outcome of the wound after the dual-frequency ultrasound treatment. Dual-frequency ultrasound can be a therapeutic tool to promote wound healing and prevent the remnant wound from becoming chronic. Dual-frequency ultrasound is safe, has few side effects, and is a useful tool to increase the completeness of the procedure. Wound healing process is commonly divided into three phases; inflammation, proliferation and maturation. But, in fact, wound healing cascade occurs more delicate and complicated by response and communication between the wound healing cells and the inflammatory mediators. Delayed wound healing is result of hypoxia, infection, swelling and metabolic imbalance. Delayed wound like diabetic gangrene, pressure sore, venous ulcer and recalcitrant remaining postoperative wound is always concern of plastic surgeons, because it sometimes requires additional procedure. Consequently, it brings increase of cost and hospital day, also decrease of patient’s satisfaction. Recently, the energy based treatment; ultrasound, low-level laser therapy, light-emitting diodes, extracorporeal shock wave therapy, are getting more popular. Among them, LDM®-MED (Wellcomet, Karlsruhe, Germany) is ultrasound wound treatment modality that promote a wound healing process using a dual frequency system for mechanical micro-massage effect. In this study, we used LDM®-MED for recalcitrant wound treatment with favorable result. The retrospective study includes eight patients from May 2015 to May 2018 who underwent various types of surgery and the application of LDM®-MED for remaining wounds. The number of treatment until the wound was completely epithelialized by photographic findings and chart review were done. And four-point subjective scale of satisfaction was used to evaluate satisfaction. We compared clinical outcomes to those of other literatures. Patients were treated daily or every other day for 6 minutes per day by Ulcus cruris mode (3/10 MHz dual frequency setting with intensity of 1.0 W/cm2 and 2.0 W/cm2 each for 3 minutes) of LDM®-MED dermatologic program. Ultrasonic gel was used as coupling medium during all treatments. Photographs were taken at each treatment session, and satisfaction surveys were conducted after all treatments were completed. Tables 1 and 2 show the result of treatment. Total eight patients treated about their postoperative remaining wound. There are two patients who had radiation ulcer, and they required more treatment sessions, but eventually, totally healed (Fig. 1). The other six patients have simple postoperative wound without radiation (Fig. 2). The average periods for complete epithelization of radiation group is 70 days, the average treatment time is 28.5. In literature, Delanian et al.1 reported 53% healing using pentoxifylline and vitamin E combination therapy. And, Delanian and Lefaix2 also reported 7 of 8 patients experienced complete recovery of wound in 6 ± 2 months by pentoxifylline tocopherol clodronate triple-drug therapy. The average periods for complete epithelization of non-radiation group is 12.2 days, the average treatment time is 10. 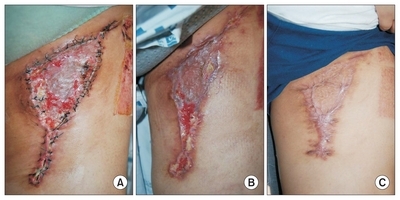 In burn and other raw surface wounds, 3 weeks has been traditionally used as cutoff point for surgical intervention like skin graft.3 Most of disrupted wound with soft tissue defect takes more than 3 weeks for complete re-epithelization. There were no complication nor recurrence of wound during the follow up period. Most of patients expressed satisfaction to the outcome of the wound after LDM®-MED treatment. Wound healing process consists of local inflammation, granulation tissue formation, re-epithelization, and remodeling of extracellular matrix. These process are closely associated with collagen turnover as well as with a shifting of the balance between the processes of production and degradation in the involved connective tissue. And, this balance is controlled by mesenchymal cells and various enzymes like matrix metalloproteinases (MMPs). In recent, two theories to explain the pathophysiology of chronic wound healing were proposed. One is based on the over-expression of MMPs in the wound, another is connected with the under-expression of heat shock proteins (HSPs). Theoretically, treatment suppressing MMPs and stimulating HSPs simultaneously is the ideal treatment. But, unfortunately, the optimal selected suppression of some MMPs in the wound does not necessarily coincide with the optimal strategy of HSP-stimulation.8 So, we need to approach to this complicated situation with dual treatment method. It is the theoretical basis of the Dual-frequency ultrasound treatment. Ultrasound with its various mechanical, thermal and chemical effects on cells and tissues has had different applications in medicine and aesthetics for a long time. One of the most important effects of ultrasound is a micro-massage caused through large pressure gradients in an ultrasound wave. The amplitudes of the transient pressure oscillations in an ultrasound wave of moderate intensity are much higher than the atmospheric pressure and they fall down over half a wavelength (approximately 1 mm). The pressure used during conventional vacuum-massage is 100 to 1000 times lower. This strong micro-massage effect of ultrasound can be increased further through the LDM® Technology. LDM®-MED (Local Dynamic Micro-Massage) is a new treatment method, which is qualitatively different from other types of massage. This technology uses two ultrasound waves of different frequencies with a rapid frequency modulation. Through this modulation new micro-massage effects, which are not present in a conventional ultrasound wave, can be obtained. If the ultrasound frequency changes from 1 MHz to 3 MHz or from 3 MHz to 10 MHz with the intensity remaining unchanged, the pressure amplitudes in the tissue will be the same. The dimension of every micro-massage unit in the tissue will however be reduced from 0.75 mm to 0.25 mm (respectively from 0.25 mm to 0.075 mm). This presents the unique possibility to produce a dynamic modulation of the ultrasound micro-massage effects. This possibility arises for the first time with the introduction of the new LDM®-Technology. In this technology the frequencies produced in one sonotrode (ultrasound head) will be exchanged very rapidly (between 100 and 1.000 times per second). Thereby a rapid pulsation of the pressure gradients in the tissue with the same modulation occurs. This is the new art of the micromassage which cannot be produced by conventional ultrasound applications. Mechanical effects of ultrasound could be influenced till now only through the regulation of the ultrasound intensity. it can be named “vertical” control of the micromassage. The postoperative recalcitrant wounds are not chronic wound yet, but considered process of becoming chronic. There are some studies on chronic wounds using Dual-frequency ultrasound,12–15 but not on acute wounds or others. We want to expand a range of application of Dual-frequency ultrasound in wound therapy, and also hope Dual-frequency ultrasound could block the processing of chronicization. In this study, every patients get complete cure of wounds without additional procedure. In comparison with data from other literatures, meaningful reduction of time for complete re-epithelization is shown. Although, we could not get any statistical mean from our study, we could get favorable treatment result from the Dual-frequency ultrasound treatment. Furthermore, Dual-frequency ultrasound doesn’t make any pain or discomfort during treatment sessions. So, we expect this non-invasive, convenient wound therapy could become a reasonable alternative for surgical treatment for recalcitrant remaining wound. The limitation of this study is that this study only includes eight patients, and is a retrospective study. And there is no pathologic study for objective evidence of wound healing process. Further large scale prospective studies with pathologic demonstration are needed to make more precise evaluation of effectiveness of Dual-frequency ultrasound treatment. Dual-frequency ultrasound can be a effective therapeutic tool to promote wound healing and prevent the remnant wound from becoming chronic wound. Dual-frequency ultrasound is safe, has little side effects, and is considered a useful tool to increase the completeness of the procedure. Fig. 1. Wound after breast reconstruction on radiation therapy patient. (A) After 4 sessions. (B) After 14 sessions. (C) After 37 sessions. Fig. 2. Inguinal dissection wound in malignant melanoma patient. (A) Before. (B) After 6 sessions. (C) After 19 sessions. Delanian, S, Balla-Mekias, S, and Lefaix, JL (1999). Striking regression of chronic radiotherapy damage in a clinical trial of combined pentoxifylline and tocopherol. J Clin Oncol. 17, 3283-90. Delanian, S, and Lefaix, JL (2002). Complete healing of severe osteoradionecrosis by treatment combining pentoxifylline, tocopherol and clodronate. Br J Radiol. 75, 467-9. Yeong, EK, Hsiao, TC, Chiang, HK, and Lin, CW (2005). Prediction of burn healing time using artificial neural networks and reflectance spectrometer. Burns. 31, 415-20. Herouy, Y (2004). The role of matrix metalloproteinases (MMPs) and their inhibitors in venous leg ulcer healing. Phlebol. 44, 231-43. Gill, SE, and Parks, WC (2008). Metalloproteinases and their inhibitors: regulators of wound healing. Int J Biochem Cell Biol. 40, 1334-47. Verbeke, P, Fonager, J, Clark, BF, and Rattan, SI (2001). Heat shock response and ageing: mechanisms and applications. Cell Biol Int. 25, 845-57. Sõti, C, Sreedhar, AS, and Csermely, P (2003). Apoptosis, necrosis and cellular senescence: chaperone occupancy as a potential switch. Aging Cell. 2, 39-45. Kruglikov, I, and Kruglikova, E (2011). Dual treatment strategy by venous ulcers: pilot study to dual-frequency ultrasound application. J Cosmet Dermatol Sci Appl. 4, 157-63. Sontag, W, and Kruglikov, IL (2009). Expression of heat shock proteins after ultrasound exposure in HL-60 cells. Ultrasound Med Biol. 35, 1032-41. Meyer-Rogge, D, Rösken, F, Holzschuh, P, D’hont, B, and Kruglikov, I (2012). Facial skin rejuvenation with high frequency ultrasound: multi-centre study of dual-frequency ultrasound. J Cosmet Dermatol Sci Appl. 2, 68-73. Park, JY, Ahn, MK, Cho, EB, Park, EJ, and Kim, KH (2018). Dual-frequency ultrasound as a new treatment modality for refractory rosacea: a retrospective study. Dermatol Surg. 44, 1209-15. Choi, YS (2017). Clinical experience of an effective treatment of intractable chronic venous ulcer on the lower leg using dual-frequency ultrasound. Med Laser. 6, 29-31. Choi, YS, and Park, ES (2017). Application of dual-frequency ultrasound to radiation-induced fibrosis in a breast cancer patient. Med Laser. 6, 86-9. Roche, C, and West, J (1984). A controlled trial investigating the effect of ultrasound on venous ulcers referred from general practitioners. Physiother. 70, 475-7.